Iowa's Democratic Party chairman is hinting at even more political engagement in the future from Alec Baldwin, saying he thinks the liberal actor's increased participation in Democratic Party activities is "just going to the beginning." Baldwin has long been an outspoken liberal and booster for Democrats, although he criticized them earlier this month as "flabby" and "out of touch" after their unsuccessful 2016 election cycle. He won an Emmy this year for his portrayal of President Donald Trump on "Saturday Night Live." Baldwin will be the featured speaker at an Iowa state party dinner next month "that is traditionally a proving ground for future presidential candidates," CNN reported Tuesday. On Saturday, the actor signed a fundraising email for Virginia Democratic gubernatorial candidate Ralph Northam, and earlier this year, he attended a fundraiser for New Jersey Democratic gubernatorial candidate Phil Murphy that raised $5.1 million. "It was his idea to start doing more work at the state party level. He wants to start doing more to take an active role and help state parties grow," said Troy Price, the Iowa Democratic Party chairman. "I think this is just going to be the beginning." Baldwin has a rich acting career, appearing in dozens of movies and earning wide acclaim for playing NBC executive Jack Donaghy on "30 Rock." But he also has a history of volatile, offensive behavior. 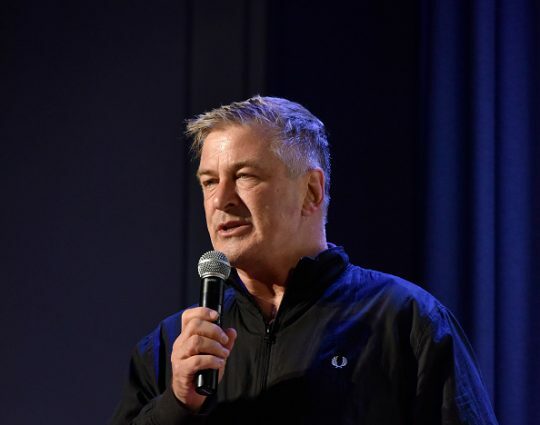 Baldwin once left a voicemail for his daughter Ireland when she was 11 calling her a "rude thoughtless pig," and Ireland has said her father has "anger management issues." Baldwin also stated in 1998 he wanted to lead a mob to stone Republican Henry Hyde and kill his wife and children, although it was unclear if it was a planned bit during an interview with late-night host Conan O'Brien. The actor has a history of physical skirmishes with photographers and using homophobic insults online, and he lost his MSNBC hosting gig after just four episodes in 2013 when he was seen calling someone a "cocksucking fag" on the street. Nevertheless, Democrats have expressed excitement at Baldwin's commitment to elect Democrats in local races around the country. He previewed his Iowa speech in a statement this month. "Heading into the 2018 midterm elections and beyond, I have decided to rededicate my efforts to helping the Democratic Party win across the country. That effort begins in earnest in Iowa on Monday, Nov. 27," Baldwin said. "There will be many more opportunities both before and after, and you can plan on seeing me out there with folks on the ground fighting this most important battle for our future." Michael Keegan, president of the left-wing People for the American Way, said he knew Baldwin to be a "thoughtful political analyst and very committed person through the movement, and [he] could not be more helpful now in electing great progressives in the states to start building a bench." The Republican National Committee mocked Democratic reliance on another Hollywood star in a statement from spokesman Michael Ahrens. "Democrats should spend more time finding a legitimate candidate with a positive message, instead of hanging out with a New York City liberal who just plays one on TV," he said. This entry was posted in Politics and tagged Alec Baldwin, CNN, Democratic Party, Iowa, Saturday Night Live. Bookmark the permalink.